Push notifications appear as browser alerts linked to your landing page. Follow the instructions below to create a new Push campaign or edit your existing Push campaigns. Click Push at the top of the page, then click the + NEW CAMPAIGN button. Campaign Name: You should name your campaign something that will help you stay organized, such as the name of the offer. Status: You can choose to set a campaign to active or paused upon creation. NOTE: This setting is also available at the ad group level. You can pause certain ad groups without pausing the whole campaign. Budgeting: Set a daily and total budget for your campaign. You can also choose to leave blank for unlimited spend. The budgets you set here will be shared by all ad groups within the campaign. NOTE: This setting is also available at the ad group level. You can decide how much of your campaign’s budget you’d like to spend on each ad group. Delivery Speed: Apply either Paced Speed or Express Speed depending on how quickly you’d like your ads delivered. Learn more about Delivery Speed. 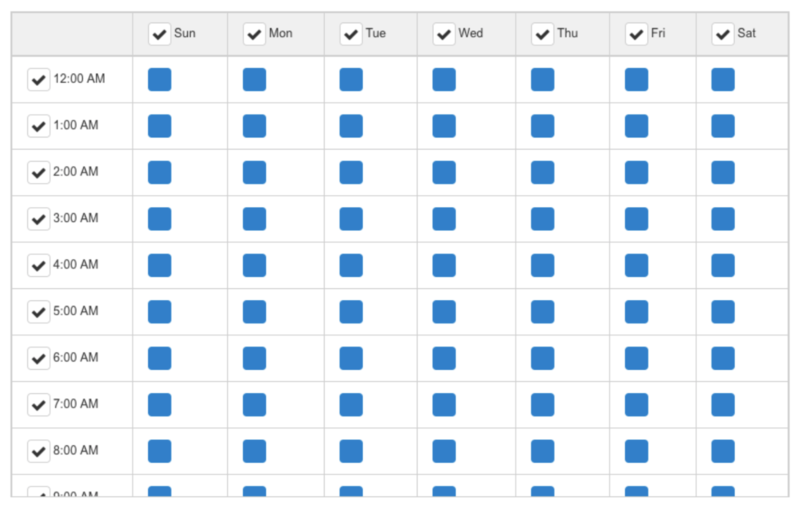 Scheduling: Set a custom schedule if you want all ad groups in your campaign to receive traffic only during certain days and times. NOTE: This setting is also available at the ad group level if you would like to further restrict schedules for certain ad groups. Frequency Capping: Set a frequency cap to limit the number of times a user can see the ads in your campaign within a given period of time. For example, setting your frequency cap to 3 impressions in a 36 hour time period means a user can see 3 ads in your campaign during the 36 hour time period, but no more until the 36 hours have elapsed. NOTE: This setting is also available at the ad group level if you would like to set a stricter frequency cap for certain ad groups. Click Capping: Set a click cap to limit the number of times a user can click the ads in your campaign within a given period of time. For example, setting your click cap to 3 clicks in a 36 hour time period means a user who clicks your ad 3 times within 36 hours will not be shown your ad again until the 36-hour time period elapses. NOTE: This setting is also available at the ad group level if you would like to set a stricter click cap for certain ad groups. 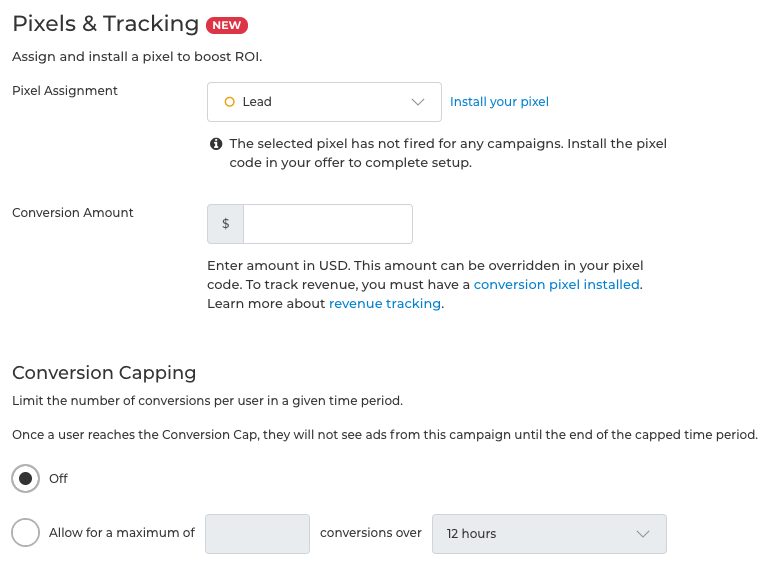 Pixels & Tracking: After you assign a pixel to your campaign, you will have access to conversion capping and revenue tracking. Conversion capping prevents your ad from showing to users who have already converted on it within a given time frame – saving you money! With revenue tracking, you can see which settings and types of traffic are most profitable, allowing you to optimize in RTX Platform with ease. NOTE: Conversion tracking, revenue tracking, and conversion capping will not work until you complete your pixel setup. Learn how to track conversions on RTX Platform. Be sure to save your changes at the bottom of the page when you are done customizing your settings! You can edit your campaign settings at any time. Simply navigate to the Campaigns tab within the Push section and click the name of the campaign you wish to edit. Next, select Settings. Make any necessary changes and be sure to save your changes at the bottom of the page when you are done. Next, learn how to create, customize, and edit ad groups within Push campaigns. Ad groups allow you to target specific audiences within a campaign, allocate budgets, customize bids more granularly, and increase your ROI.